Dr. Vu provides treatment with BOTOX® and other neuromodulators, such as XEOMIN®, to help Huntington Beach patients look more relaxed, rested, and youthful. These injectable aesthetic solutions are some of the most popular among patients in the United States, both because of their effectiveness and their non-invasive nature. A wrinkling of your brow can show concentration or fatigue. A furrow between your eyebrows can make you appear angry or concerned. Crow’s feet at the corner of your eyes can indicate happiness, but they also may age your appearance. In younger years, lines and wrinkles in these areas will not typically appear unless you purposefully make an expression of focus, anger, or happiness. 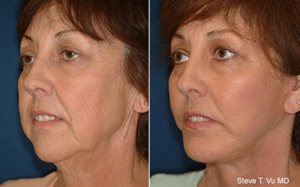 However, as you get older, the muscles that animate these areas of your face may activate more frequently, and, over time, the lines and wrinkles can deepen and become permanent. BOTOX and other neuromodulators relax the muscles of facial animation in a targeted way, reducing the appearance of these wrinkles. BOTOX is an injectable treatment with benefits that typically last 3-5 months based on the dose that Dr. Vu uses. This means that Huntington Beach patients can trial BOTOX, assess their results, and then decide whether to get re-treatment. While the commitment with BOTOX is low, there can be a big difference in the care that individual providers offer. Precise technique, years in practice, and a highly trained aesthetic eye matter a great deal in both the experience you have and the outcome you get. Huntington Beach patients choose Dr. Vu for treatment because he excels in each of these areas. As a plastic surgeon, he has comprehensive knowledge of facial anatomy and the underlying musculature. This background promotes patient comfort and safety. In general, Dr. Vu’s preference is to inject BOTOX conservatively. His technique promotes more natural expression after treatment. It also allows for fine-tuning over the course of multiple treatments. After receiving injections, patients can return to Dr. Vu’s practice in Huntington Beach and discuss the results that they experienced based on their last visit. Dr. Vu can then target lines and wrinkles more effectively with an adjusted dose. ALLERGAN™, the maker of BOTOX®, offers the Brilliant Distinctions® rewards program to help patients save on the cost of its injectable aesthetic products. Dr. Vu’s practice participates in this program so that those in his care can get the most from their treatment. By joining Brilliant Distinctions, you can earn points towards discounts on future treatments, either for BOTOX or for other aesthetic injectables that Dr. Vu may recommend. Patients can also earn points by frequenting certain shops and stores. Ask Dr. Vu’s staff about Brilliant Distinctions during your visit to our Huntington Beach practice. Your visit will start with a conversation about whether you have received BOTOX in the past. If you have had injections previously and have a good idea of what works for you, Dr. Vu can work to duplicate these results. If you are new to BOTOX, Dr. Vu will take the time to go over what you can expect and will plan a conservative course of treatment. He will talk with you about the length of BOTOX’s effects and the sites he recommends treating to achieve your goals. Dr. Vu will also let you know if any of the lines that you want to treat are close to sensitive facial structures, and he may recommend not injecting in these areas to protect natural expression. Most of our Huntington Beach patients don’t need any sort of anesthesia, but Dr. Vu can provide ice for you to numb the area to make the experience more comfortable. He will use a tiny needle typically reserved for diabetics who take regular insulin injections. He will spread the BOTOX evenly throughout the treatment site to create the best result possible. Getting BOTOX and other neuromodulators is a non-invasive experience. You can go back to work and other normal daily activities immediately after treatment, though Dr. Vu will advise you not to exercise for 24 hours afterward. You should notice a reduction in the lines and wrinkles that Dr. Vu treated within one or two days. The effects of BOTOX are not permanent. In general, our patients in Huntington Beach see the benefits of treatment for 3-5 months. The duration varies because of the different amount of BOTOX patients may get; the activity of their muscles; how they metabolize the medication; and other factors. This makes BOTOX a great option for people who want aesthetic improvement but who aren’t ready for the permanent effects of surgery. IF I STOP GETTING BOTOX, WILL MY LINES AND WRINKLES GET WORSE THAN THEY WOULD HAVE NATURALLY? No. You can stop treatment at any time, and your features will age at the same rate as they would have before you got BOTOX. HOW DOES DR. VU ENSURE QUALITY IN HIS CARE? Dr. Vu is an expert injector with 20 years of experience. As the popularity of BOTOX has grown, so have the number of providers offering injections to their patients. While many of the practitioners who conduct these treatments are well-trained and committed to effective care, this is not the case with every provider out there. Dr. Vu has distinguished his work in part by staying committed to high-quality, highly reliable materials and techniques. For example, he purchases his medications from U.S. manufacturers only, which tend to have a more dependable supply chain and better production standards. Another example: some providers use over-dilution as a tactic to cut costs while decreasing the medicine’s effectiveness. Dr. Vu uses a concentration of BOTOX that has worked well for his patients for more than 20 years, and he will continue to follow best practices to provide the highest level of care. Reduce the appearance of crow’s feet, frown lines, and forehead wrinkles with BOTOX. Schedule an appointment in Huntington Beach by contacting the practice online or by calling (714) 848-1133.